While no one single nutrient will completely make or break your weight-gain progress, getting enough protein in your diet is key for maximizing weight gain. On top of needing extra calories to add pounds, you'll also need more protein than the average sedentary person, especially if you're trying to gain muscle. Your protein intake can come from high-protein foods -- like meat or beans -- or from protein supplements. Eating to gain weight doesn't just require upping your calorie intake; you should increase your protein intake as well. While the average sedentary person needs just 0.36 gram of protein per pound of body weight, people who strength-train -- which includes those trying to gain lean weight -- should eat 0.73 to 0.82 gram per pound. If you're 135 pounds, that works out to 99 to 111 grams of protein each day; if you weigh 175 pounds, it's 128 to 144 grams. While it's important to meet your protein needs so that part of your weight gain comes from muscle, eating significantly more protein than you need doesn't offer extra benefits. You can only use 0.91 gram of protein per pound of body weight each day, and extra protein can get stored as fat. So if you weigh 135 pounds, for example, there's no added benefit to eating more than 123 grams of protein per day. Even though you need more protein when you're gaining weight, you'll likely have no trouble meeting your recommended protein intakes. 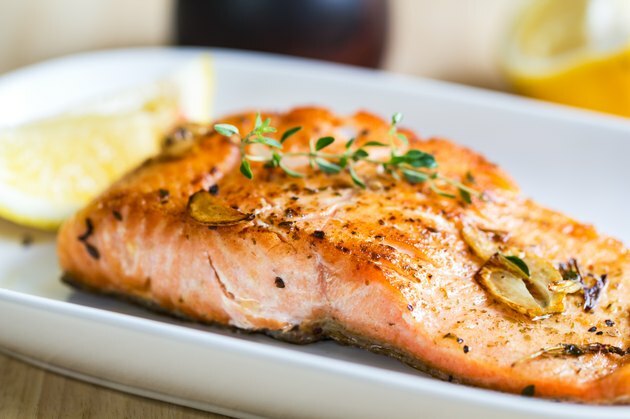 A single 6-ounce portion of fatty fish -- like salmon or tuna -- supplies 44 grams of high-quality protein, while eating 3 ounces of turkey breast increases your protein intake by 26 grams. Make a "chicken Parmesan" that's weight-gain friendly by topping a 6-ounce chicken breast with a spoonful of tomato sauce and an ounce of Parmesan cheese, and you'll have an entree that supplies 42 grams of protein. Cottage cheese, eggs, full-fat milk and Greek yogurt also contain high-quality protein for weight gain. You can also meet your protein needs with plant-derived foods. A cup of edamame, for example, contains 29 grams of protein, while black and lima beans each contain 15 grams of protein per cup. Whole grains, nuts and vegetables also contain small amounts of protein. While most plant-based foods are low in at least one amino acid you need for muscle gain, eating protein from a variety of plant-based foods ensures you'll get what you need. Upping your protein intake might offer more benefits in relatively fit people compared to exercise newbies. When you first start training, you effectively "shock" your system with your new, active lifestyle, so you'll see significant progress in a short amount of time, even if your diet isn't perfect or your exercise program isn't ideal. As you get fitter, though, those results naturally taper off, and you'll have to work harder to continue to see gains. Once you've achieved your "newbie" gains, taking protein supplements might help you continue to see results, according to a review published in Sports Medicine in 2015. The review authors looked at the results from over 35 previously published studies that looked at the potential benefits of protein supplementation on strength and weight gain. While exercise newbies following less-demanding exercise didn't typically see any added benefits when taking protein supplements, people following more vigorous workout programs did tend to see beneficial results for muscle gain. Talk to your doctor before taking protein supplements, though, because people with certain underlying medical conditions, such as kidney disease, shouldn't get too much protein. There's no set amount of supplemental protein that's recommended for everyone who's trying to gain weight. A nutrition professional can help you figure out if you really need a supplement and, if so, recommend a type and amount that best meets your needs. Weight gain isn't just about getting enough protein. If you're eating lots of protein but living a sedentary lifestyle, for example, you won't gain muscle -- you'll just store the extra calories as fat. So you'll need to strength-train regularly -- around three times per week -- to see results. When it comes to your diet, you'll also need high-quality carbs and protein. Nutritious whole grains and fruit, for example, supply carbohydrates that are stored in your muscle as glycogen. When you work out, this glycogen serves as a source of quick energy so that you can push through a tough workout. Healthy fats in your diet also provide energy so you can keep up with the active lifestyle needed for weight gain, while the veggies in your diet provide minerals and vitamins you need for a healthy metabolism, strong bones and immunity.